With a fuelled-up weight of 235 kilos (513lb), the RST1000 Futura is a lot of bike to drop. As standard and without panniers, it’s also vulnerable to the sort of damage that can incapacitate the bike, even in a static tipover or an off at walking pace. Back brake and gear levers. Even a static tipover can scratch lower and middle panels badly. Radiators are also vulnerable to a low speed drop, which breaks a tab glued in at the factory. 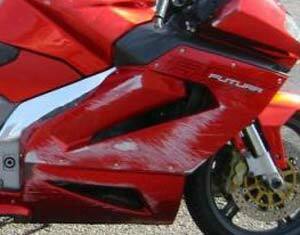 If this happens to you, the bike won’t leak coolant if the engine isn’t running. But when you start it, coolant will gush out at an alarming rate. 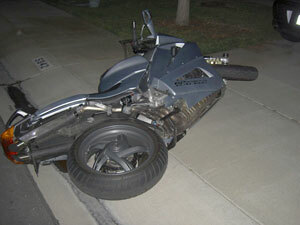 DO NOT ATTEMPT TO RIDE THE BIKE IN THIS CONDITION! Radiators can be fixed. See the radiator repair guide. Heavier crashes tend to damage all of the above, as well as the top fairings, which is bad news indeed, and even the brake calipers. It can take as little as a static tipover to write off the bike. Panels tend to bend, rather than break and if not too badly damaged wil regain their shape. Currently e-bay and breakers seem to be the best place to get replacement middle and lower sections, though remember that Flame Red fades so you’ll be lucky to get a close match. Occasionally new panels crop up on e-bay, but upper panels and mirrors tend to be rare and therefore expensive. Mirrors from several other bikes can be made to fit. See the mirror modification page for more information. Paint can be hard to match – see the colours page for more information, and the photo galleries for ideas of custom paint jobs. Brake and clutch levers are easy enough to buy aftermarket, and footrests from other bikes will go on. The rear brake and gear levers are unique to the Aprilia Futura so the options are e-bay/breakers, or of course a new replacement. They come in several separate pieces. However, good quality engine/frame-mounted crash bungs, especially when coupled with factory hard luggage, can prevent a lot of damage and some owners have also added front wheel spindle-mounted crash bungs to protect brake calipers. I’m not saying they will prevent damage in all accidents as no two are exactly the same, but the collective experience of many owners has shown that crash bungs can increase your chances of being able to continue your journey after a low speed spill. Some members of the Apriliaforum have reported the Futura as surprisingly crash-resistant with crash bungs and panniers – even at speeds of up to 50 mph. But if you and/or the bike hit something, then all bets are off. See the modifications section for more information on crash bungs.